Hermès brings the world of wild life to the table in form of its Carnets d’Equateur tableware collection. 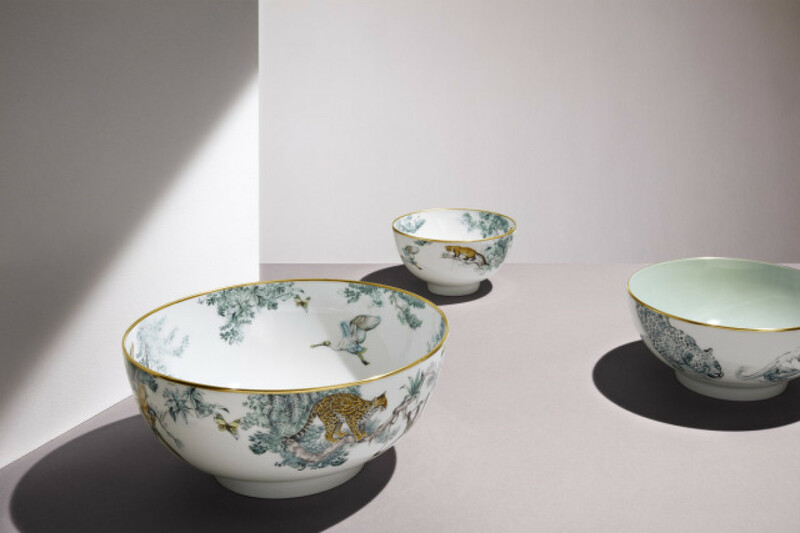 The French maison pays tribute to the work of the late wildlife artist Robert Dallet and tames it elegantly to make up its annual tableware collection. Some of the elaborate creations of the thirty five pieces of the exotic theme range feature lions, tigers, elephants, monkeys, parrots and other creatures inhabiting the luxuriant foliage. The rest of the collection also includes items with simpler sketches on celadon porcelain. WWD reports that while a soy sauce bowl will sell for $70, a large vase will sport a $2,483 tag. Hermès Carnets d’Equateur tableware collection will hit the tables in March. We have already seen the Hermès Picotin Lock Handbag inspired by Robert Dallet as well as Hermès Exceptional Silk Scarf: Carré Couture based on Robert Dallet’s original sketches.